I feel like I am so behind on bella terra posts that I've got to give you another immediately following my last. Its the time of year, I suppose - even the farmer's market has exploded with dozens of options for fresh local produce. So many things are happening in the garden that I am having a very hard time keeping up. 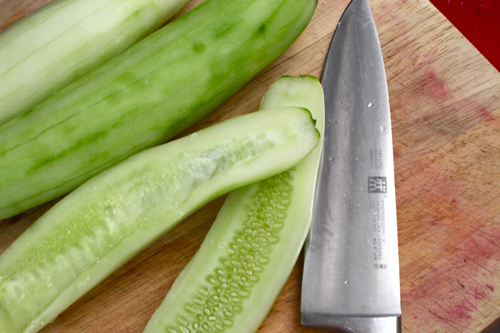 In fact, as I write this, the very last cucumber that we will get this year is ripening on the vine, and I haven't even shared a recipe with you yet! 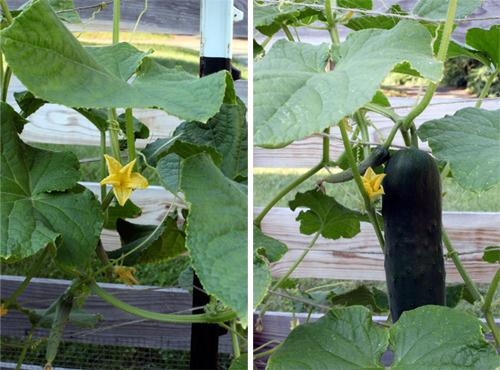 The rest of the cucumber plants have started browning from the ground up, wilting away in the high-80* heat we've had these last few weeks. Soon their place will be taken with new plantings of fall crops...once I figure out what those will be. We enjoyed an abundance of cukes this year, many more than we've been able to handle gracefully. 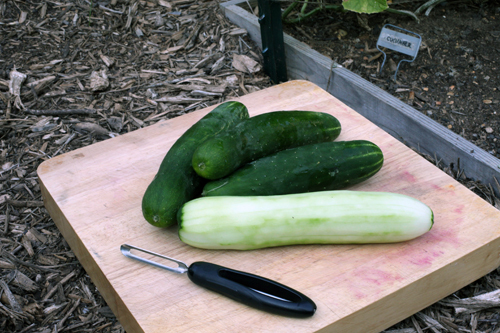 I've shamelessly offered them to anybody who will take them, and am usually met with a pleased-yet-baffled look as I hand over an armload of huge cucumbers and am asked "any suggestions"? Salads, of course. Lots and lots of salads. Maybe this one - even though cucumbers aren't listed in the ingredients I think they would make a fine addition. Same goes for this one, which you're probably already making what with all the beets showing up in farmer's market booths and grocery stores this time of year. Throw some cucumbers in, they'd be great mixed with those golden globes, purple cabbage and just-off-the-vine tomatoes. But if you're looking for something new, something with a fresh California-inspired, deconstructed guacamole flavor, I've got just the salad for you. 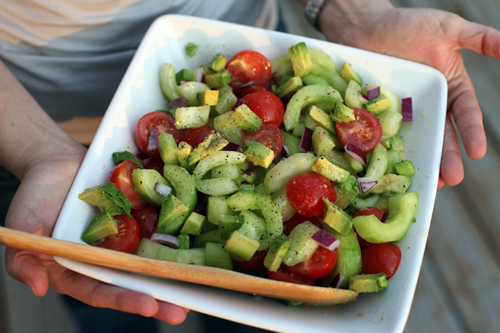 It screams summer, with its refreshing bites of cucumber and juicy tomato. 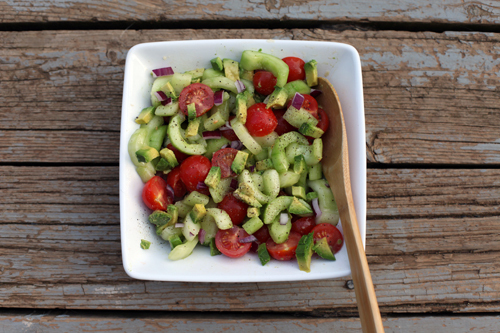 The red onion adds just the right amount of bite that is tempered slightly by the creamy avocado. Take it to a picnic, a backyard fiesta or an evening dinner on a friend's front porch. Margarita not required, but definitely recommended. Want to read more about our garden?